Why Beta Cells need to be saved? Very early !! We at apex are committed to the cause of preventing all forms of Diabetes and even aim for Remission of Diabetes. As strategy protection, preservation and even regeneration of Beta Cells can go a long way in combating Diabetes and its morbid consequences. Considering the physiopathology of diabetes, preventing beta cell degeneration and stimulating the endogenous regeneration of islets will be essential approaches in treatment of diabetes. It is believed that beta cell can regenerate through the replication of pre-existing beta cells or neogenesis from stem cells and progenitor cells inside or outside the islets. Among the hundreds of plants that have been investigated for diabetes, a small fraction has shown the regenerative property . Supplementation with Pterocarpus marsupium, Gymnema sylvestre, Curcumin and Resveratrol are natural remedies that help in protection, preservation and regeneration of Beta Cells by various mechanisms. Pterocarpus is a very promising plant for combating diabetes since it has a wide variety of anti diabetic actions and is also proven in human clinical trials. The hypoglycaemic effects, antidyslipidaemic effects, antioxidative effects and the safety of the PM heartwood and the bark have been scientifically validated using a multitude of in vitro and in vivo studies. Multiple mechanisms responsible for hypoglycaemic effects of PM include Beta-cell regeneration, insulin release and insulin-like actions of some compounds isolated were identified. Additionally, inhibitions of alpha-amylase, alpha-glucosidase and protein glycation have also been demonstrated . Several compounds including Pterostilbene, Pterosupin, Marsupsin, (-)-Epicatechin and Liquiritigenin isolated from the Pterocarpus marsupium were identified as compounds with hypoglycaemic effects . A landmark ‘flexible dose double blind multi centre randomized controlled trial’ on 177 patients by an ICMR Study Group proved that Vijayasar (Pterocarpus marsupium) in a dose of 2-4 grams per day for 36 weeks was comparable in efficacy to Tolbutamide . Another prospective, open, and non-randomized trial on 56 patients (Patidar et al) has ascertained the blood glucose lowering effect of P. marsupium as add-on therapy in patients with uncontrolled Type 2 diabetes mellitus. Reduction of mean FBG (fasting blood glucose), PBG (post prandial blood glucose) and HbA1c at the end of 12 weeks treatment with P. marsupium as add-on therapy to conventional oral hypoglycemic drugs was highly significant for all these parameter. The safety aspect of P. marsupium was also established with the dosage up to 4 g/day. There was no episode of hypoglycemia occurred in any patient . They quote other studies to say that P. marsupium causes pancreatic β-cell regeneration. 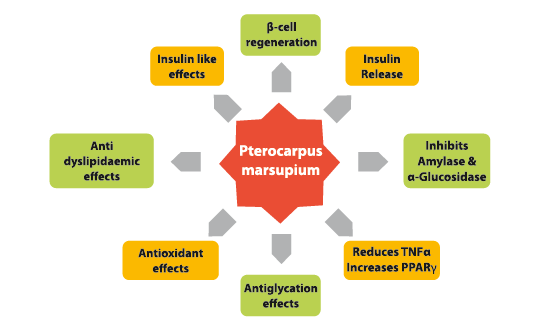 Other mechanisms of P. marsupium may be increased release of insulin from β-cells, prevention of insulin resistance and hindering the absorption of glucose from intestine. 200 mg/d of G. sylvestre extract decreased the required insulin dose by 50% and lowered A1C in both type 1 diabetes and T2DM. It also increased the number of beta cells in the pancreas and therefore the internal production of insulin . When 400 mg/d of G. sylvestre extract is taken with conventional hypoglycemic drugs such as glyburide or Tolbutamide, some patients were able to reduce the dose of the drug or even discontinue its use. In vivo studies with oral administration of an extract of G. sylvestre, (1 g/d for 60 d) induced a significant increase in circulating insulin and C-peptide, which were associated with significant reductions in fasting and postprandial blood glucose. In vitro measurements using isolated human islets of Langerhans demonstrated direct stimulatory effects on insulin secretion in human cells, consistent with an in vivo mode of action through enhancing insulin secretion. As a result, it also stabilizes blood sugar and decreases insulin doses . Turmeric (Curcuma longa), a rhizomatous herbaceous perennial plant of the ginger family, has been used for the treatment of diabetes in Ayurvedic and traditional Chinese medicine. The active component of turmeric, Curcumin, has caught attention as a potential treatment for diabetes and its complications primarily because it is a relatively safe and inexpensive drug that reduces Glycemia and Hyperlipidemia. The effect of Curcumin on pancreatic cells has been extensively studied. Curcumin abates oxidative stress due to reactive oxygen species and lipid-peroxidation by reducing hyperglycemia, and enhancing endogenous antioxidant machinery (glutathione peroxidase, catalase, superoxide-dismutase, and reduced glutathione, and GSH). Our study provides clear evidence of pancreatic islets regeneration in response to treatment . This could be attributed to the anti –inflammatory and antioxidant effects of Curcumin and thus creates a favorable systemic and pancreatic environment to foster islet neogenesis. Also, the role of Curcumin in cell proliferation and differentiation of stem cells may be involved . Curcumin increases islet viability and delays islet ROS production. Curcumin treatment increased the number of small pancreatic islets and decreased lymphocyte infiltration in pancreatic islets. Curcumin increased islet regeneration and basal insulin secretion in human islet . Resveratrol (RES) and Curcumin (CUR) are polyphenols that possess medicinal properties that are beneficial in various diseases, such as heart disease, cancer, and type 2 diabetes mellitus (T2DM). In T2DM, cAMP plays a critical role in glucose- and incretin-stimulated insulin secretion as well as overall pancreatic Beta-cell health. A potential therapeutic target in the management of T2DM lies in regulating the activity of phosphodiesterases (PDEs), which degrade cAMP. Both Resveratrol and Curcumin have been reported to act as PDE inhibitors. Treating Beta-cell lines and human islets with these polyphenols led to increased intracellular cAMP levels in a manner similar to 3-isobutyl-1-methylxanthine, a classic PDE inhibitor. Furthermore, Resveratrol and Curcumin inhibited PDE activity in a dose-dependent manner in Beta-cell lines and human islets. Collectively, we demonstrate a novel role for naturally occurring polyphenols as PDE inhibitors that enhance pancreatic b-cell function.. In T1D, animal studies clearly demonstrate that Resveratrol decreases blood glucose levels and protects β-cells . It is known that the β-cell failure in type 2 diabetic patients is generated by glucotoxicity, lipotoxicity, oxidative stress, inflammation, amyloid formation, endoplasmic reticulum stress and other factors. The anti-diabetic action of resveratrol is recently well established in animal models of insulin-deficient diabetes. It is very likely that the direct influence of resveratrol on pancreatic β-cells plays a pivotal role in this action. Resveratrol-induced partial regeneration of β-cells in diabetic animals results in the increase in blood insulin levels . Fig.2 (Ref 9).Direct and indirect effects thereby resveratrol improves insulin secretion from pancreatic islets of animals with experimental type 2 diabetes. RSV – Resveratrol, ROS – reactive oxygen species, UCP2 – uncoupling protein 2. 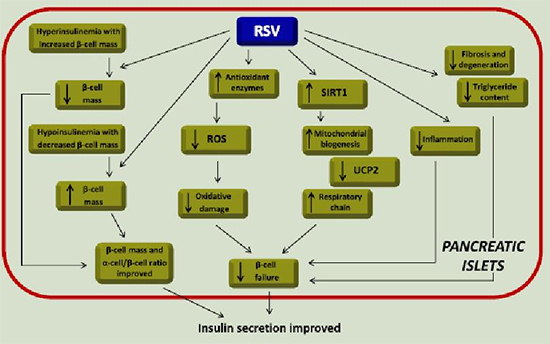 In an animal model of type 2 diabetes with decreased β-cell mass, resveratrol was shown to improve islet structure and function, reduce oxidative stress, restore islet architecture, decrease islet destruction, markedly reduce islet fibrosis and attenuate other degenerative changes. Resveratrol partially prevents β-cell failure and increases β-cell mass (Fig 2). Recent studies demonstrated that resveratrol significantly reduced blood insulin levels in patients with hyperinsulinemia . Human embryonic stem cells (hESCs) retain the extraordinary capacity to differentiate into different cell types of an adult organism, including pancreatic β-cells. A study was conducted by Daniela Pezzola et al, to optimize an efficient differentiation protocol that mimics in vivo pancreatic organogenesis and to investigate whether Resveratrol may improve the final maturation step to obtain functional insulin secreting cells. They concluded that their strategy allows the efficient differentiation of hESCs into pancreatic endoderm capable of generating β-cell-like cells and demonstrates that Resveratrol improves the maturation process . The above natural substances included in Cresvin Beta are capable of regenerating Beta cells to prevent and combat Diabetes. Through adoption of healthy lifestyles that include outdoor sports, exercises, balanced diet, avoidance of stress and adequate night time sleep. The Prevention and Remission of Diabetes – PROD Initiative addresses the above factors in a holistic manner in collaboration with leading Physicians and Experts. Please go to the Reference Articles. Regular exercise is probably one of the best options to maintain Beta cell function as well as Mitochondrial Function and ensure metabolic homeostasis. Avoidance of AGE rich foods (fried, roasted and cooked at high temperatures), inclusion antioxidant rich foods like deeply coloured fruits (eg. pomegranates, blueberries, dark grapes, oranges, mangoes and strawberries), helps to protect the ‘energy producing mitochondria’ inside the Beta cells. As mentioned above, many natural compounds in our food chain help to inhibit inflammatory cytokines like TNF alpha, NFkappaB, Interleukin-6 and even trigger anti inflammatory compounds like Interleukin-10 and Adiponectin. Supplementation with Resveratrol decreases blood glucose levels and protects Beta cells . Resveratrol delays the onset of diabetes and also ameliorates the severity of the disease. These effects are accompanied by increased total islet number, increased number of insulitis free islets and improvement in general islet condition . Resveratrol reduces the pathogenicity of lymphocytes by downregulation of the action of chemokines on multiple inflammatory cell types and blocking the migration of pathogenic cells to the pancreas . Resveratrol is effective in mitigating the autoimmune destruction of β-cells . Resveratrol reverses degenerative changes to Beta cells and prevents apoptosis of Beta cells. Resveratrol blocks the activity of Caspase-3, mainly by inhibiting the cleavage of poly (ADP-ribose) polymerase PARP . Curcumin spices up the immune system and inhibits the release of proinflammatory cytokines like NF kappa B, TNF alpha, IL-6, IL 1b, MCP1 and reduces macrophage infiltration . Curcumin helps prevent Diabetes by regulating epigenetic modifications . Pterocarpus has anti-inflammatory, Beta cell protective and regenerative properties . 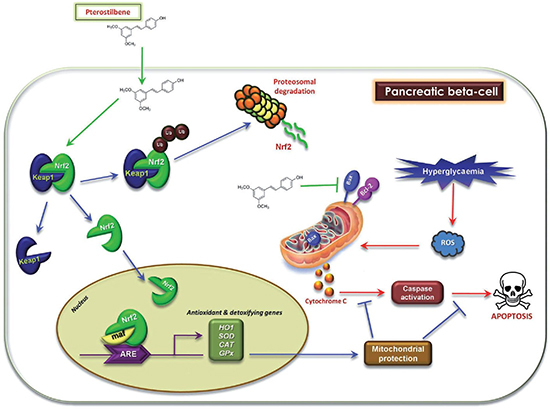 Pterostilbene (in Pterocarpus) ameliorated inflammation and acinar damage in pancreatitis . Mitochondrial dysfunction is a primary contributor to beta cell dysfunction in type 2 diabetes. Abnormally elevated islet levels of pro-inflammatory cytokines, such as IL1b and TNF alpha suppress beta cell function and mass. SIRT3 is a key regulator of mitochondrial protein acetylation; and provides protection against inflammation and apoptosis. SIRT3 is suppressed in human islets isolated from T2DM patients. SIRT3 plays a key role in the regulation of pancreatic beta cell function and in their protection from apoptotic cell death . Resveratrol activates the Sirt3 signalling pathway and attenuates oxidative stress. Sirt3 is targeted to the mitochondrial matrix where it orchestrates mitochondrial oxidative metabolism, such as the TCA cycle and oxidative phosphorylation (OXPHOS) . Exercise transiently increases the generation of ROS, but it has an overall beneficial effect for removal of cellular debris, tissue repair and rejuvenation. Mental stress, smoking, alcoholism, drug abuse and environmental pollution also cause significant Oxidative Stress. Resveratrol improves anti-oxidant defense in pancreatic tissue, i.e. increases activities of anti-oxidant enzymes (superoxide dismutase, catalase, glutathione peroxidase and glutathione-S-transferase) and protects cells from free radical damage . Pterocarpus improves the levels of SOD, catalase, glutathione peroxidase, glutathione reductase and reduced glutathione . Curcumin blocks formation of ROS and normalizes antioxidant enzymes . Avoidance of the oxidative stress inducing factors and adopting the PROD Initiative will ‘Awaken the Power Within’ you and help to prevent or delay Diabetes and other Chronic Diseases of Aging. The pancreas has a simplified ductal system surrounding the head, body, and tail of the pancreas, with scattered islets of cells at different sites. Pancreatic products, whether hormonal or non-hormonal, are secreted by distinct populations of cells, each at a specific location and with a specific function. The exocrine functions of the pancreas are carried out by acinar cells; secrete pancreatic digestive enzymes (e.g. alpha-amylase, proteases and lipases). These cells are involved in regulating the neogenesis of islet cells . The pancreas contains exocrine acinar and ductal cells, and endocrine cells that form the Islets of Langerhans. The islet cells can be classified into five distinct glandular cell types: alpha, beta, delta, epsilon and F cells. In humans, the pancreas contains an estimated one million islet cells (Bonner-Weir et al., 2010), and the islets occupy 1–1.5% of the organ’s volume. The exocrine cells occupy 95% of the pancreas in adult humans and rodents. The adult human pancreas contains one million islets and approximately 74% of them are Beta cells . Neogenesis, or the regeneration of endocrine Beta cells, occurs within a cluster of epithelial exocrine duct cells. The process commences when a subset of endocrine progenitor cells, buried within the ductal cells, starts to express Neurogenin3 (Ngn3) to form insulin secreting islets. Endocrine progenitor cells give rise to other exocrine cells including alpha cells . A small peptide secreted by pancreatic acinar cells, known as “islet neogenesis-associated protein” (INGAP). INGAP can induce Beta cell neogenesis and proliferation. It has been observed that the incubation of the INGAP peptide with human adipose tissue-derived stem cells leads to the differentiation of fat cells into islet-like cells. INGAP peptide has shown beneficial effects in T1D and T2DM. Many clinical trials of INGAP are likely to be initiated in the US . 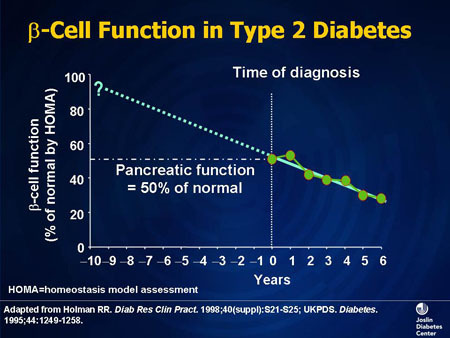 The subject of pancreatic beta cell regeneration is one of the most controversial topics of T1D research and treatment. It is believed that beta cells can regenerate through the replication of pre-existing beta cells or neogenesis from stem cells and progenitor cells inside or outside the islets (Bouwens, Rooman, 2005). Neogenesis can be originated from different cell types within pancreas: alpha cells, delta cells, duct epithelium, acinar cells, and centroacinar cells. However, this process depends on extra-pancreatic activators including hormones, growth factors, and others (Bouwens, Rooman, 2005). In adults, turnover of beta cells is slow and reduces with increasing age. However, during body growth and after injury, beta cells can replicate to maintain glucose homeostasis (Avolio et al., 2013). None of approaches under investigation have been approved for use in diabetic patients yet . Early intervention with a healthy low stress lifestyle and antioxidant rich balanced diet can preserve both Beta cells number and function. This forms the fundamental basis of the PROD Initiative. Many natural compounds from the plant kingdom are known to preserve Beta cells and even help regeneration, if the intervention is in the early stages (2-3 years from diagnosis of diabetes).Pterocarpus marsupium , Resveratrol , Gymnema sylvestre  and Curcumin  have proven Beta cell protective and regenerative properties. 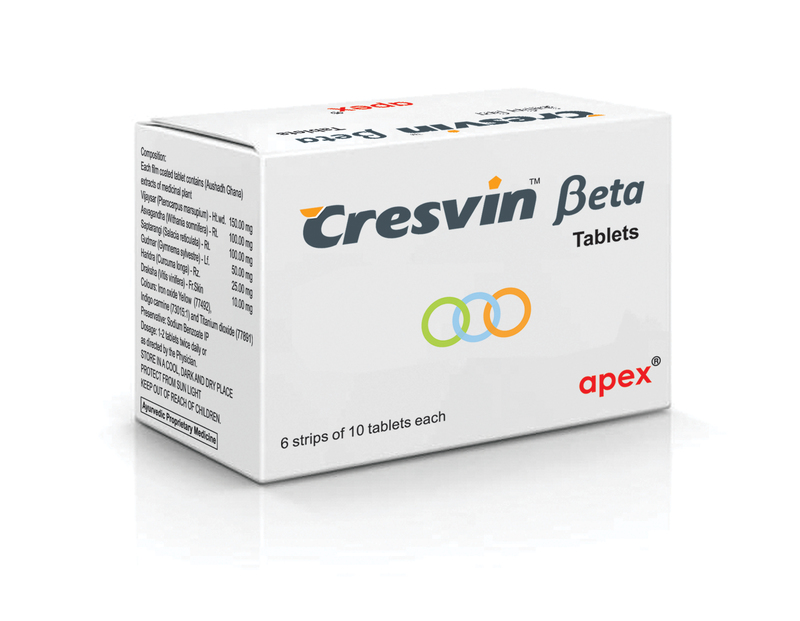 A synergistic combination of the above, Cresvin Beta, can be used as an adjunct to medication and the PROD Initiative. Beta cells in the pancreatic islets of Langerhans produce insulin. Deficiency in either beta cell mass or function, or both, can lead to insufficient level of insulin resulting in hyperglycemia (excessive levels of glucose in the blood) and diabetes. 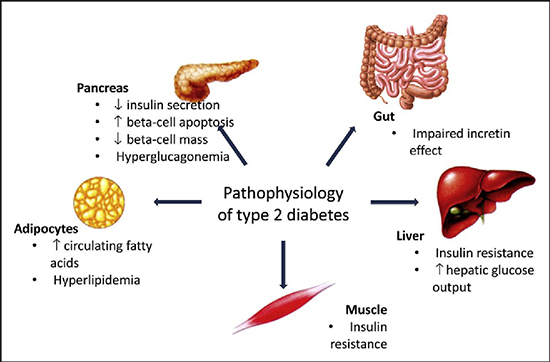 Recent studies suggest that in Type 1 and Type 2 Diabetes impairment of beta cell function is an early feature of disease pathogenesis while a substantial decrease in beta cell mass occurs more closely to clinical manifestations of diabetes. The development of novel strategies for the protection of beta cell and function could be most promising for successful diabetes treatment and prevention . Insulin resistance, hormonal imbalances, stress and mitochondrial dysfunction play an important role in the pathogenesis of all form of Diabetes. The role of mental stress and pancreatic disease is now emerging. The Prevention and Remission of Diabetes – PROD Initiative is a holistic approach, laying greater emphasis on improvement of beta cell mass and function; through diet, exercises and reduction of mental stress, in addition to medication as advised by the Physician. The total amount of insulin released, depends on the absolute number of beta cells in the pancreatic islets of Langerhans (beta cell mass) and the output of each of these cells (beta cell function). Type 1 Diabetes (T1D) is a chronic autoimmune disorder in which the immune system attacks endogenous pancreatic beta cells resulting in insulin deficiency, chronic hyperglycemia, and long- term complications. Chronic insulitis reduces beta cell mass in the pre-diabetic phase by inducing cell death directly by cell to cell contacts or pro inflammatory cytokines. In the pancreas, neighbouring cells can influence each other’s mass via several mechanisms. An intriguing autoimmune destructive process is triggered by pancreatic alpha cells neighbouring beta cells, which ultimately results in the reduction of beta cell mass and the appearance of hyperglycemia . A successful cure for T1D, needs to stop the self-damaging autoimmune process and restore appropriate insulin release from beta cells . In the pre diabetic phase initially there is a loss of ‘first phase insulin release’ as confirmed by declining ‘stimulated C peptide’ levels. The decline in ‘first phase insulin release’ is detectable even 4 to 6 years before clinical onset of T1D. After onset, beta cell destruction by the ongoing auto immune infiltration continues. It is additionally exacerbated by the increasing metabolic and glycemic overload, causing ER stress and apoptosis. In adolescents preserved beta cell mass with upto 40% residual ‘insulin- containing islets’ is observed. The residual beta cell mass and function varies with age, degree, and cellular profile of insulitis at the time of onset. In long standing diabetes the residual beta cells show signs of functional exhaustion and degranulation . Type 2 Diabetes is a progressive metabolic disorder characterised by insulin resistance and hyperglycemia. Most studies agree on a significant reduction in beta cell mass ranging from 24% to 65%, most likely due to dramatically increased rate of beta cell apoptosis. However, insulin secretion capacity in T2DM was shown to be reduced by 50%-97%. Functional beta cell compensation seems to be insufficient or to deteriorate, increasing beta cell work load and stress and resulting in functional exhaustion, dedifferentiation, and finally beta cell death . Therefore, in T2DM, the protection and recovery of beta cell function should be a main treatment and prevention target . Many experts agree that we are yet to find a cure for diabetes. Type 2 DM is a complex metabolic phenomenon involving several phenomena, such as chronic inflammation and mitochondrial dysfunction. Diabetes research is currently challenged by questions such as how to enhance survival, decrease apoptosis and replenish Beta cell mass in diabetic patients . There are approximately a 100 trillion cells in the adult human body. Each cell has the same genetic code, common to all humans, much like the hardware in our computer. All of us started as one embryonic cell in our mother’s womb. During the process of differentiation into various cell types and tissues, each cell expresses a particular set of genes. This is like a small part of the hardware in your computer, expressing or playing selected software. For example, all genes required for vision are expressed in the eyes. It still has the same genetic structure and is intimately connected to the whole body. After the differentiation of an embryonic cell into a specialized cell or tissue, it has to stay differentiated for a lifetime and perform its functions. Whole body homeostasis can continue only if the various cells and tissues perform their functions and do not revert or differentiate further. This is ensured by a set of ‘regulator genes’ which ensure that any further changes in the differentiated cells or tissue are ‘silenced’. These regulator genes are known as ‘silent information regulators’ (SIR) genes. They perform their ‘sensing, regulation and repair’ functions through a series of enzymes known as Sirtuins. SIRT1. The sirtuins are a class of histone deacetylases that inhibit gene expression. The key nutrient-sensing member of this class in mammals is SIRT1. Important downstream targets include PGC1a and NRF2, which act on mitochondrial biogenesis . Resveratrol is an agonist of Sirt1 . Intermittent fasting also activates Sirt1 and other defense mechanisms. SIRT1 is able to regulate numerous vital signalling pathways, including DNA repair and apoptosis, muscle and fat differentiation, neurogenesis, mitochondrial biogenesis, glucose and insulin homeostasis, hormone secretion, cell stress responses, and circadian rhythms . Resveratrol is the most potent natural activator of Sirt1 . Nrf2 a key transcription factor, plays an indispensable role in the induction of endogenous antioxidant enzymes against Oxidative Stress . Upon exposure to ROS, Nrf2 is liberated and binds to the Antioxidant Response Element (ARE), triggers the production of many phase II detoxifying and antioxidant enzyme genes . Resveratrol increases the transcriptional activity of Nrf2. Nrf2 activation may also contribute to the vasoprotective effects of resveratrol observed in diabetic and aging animals. As mentioned above, Resveratrol can mimic some of the molecular events characteristic of caloric restriction CR, which can also induce Nrf2 activation . Nrf2 is one of the most important cellular defense mechanisms to combat oxidative stress through regulation of phase II detoxifying enzymes and antioxidant status. These include Glutathione Peroxidase (GPx), Superoxide Dismutase (SOD), Catalase (CAT), Heme Oxygenase-1 (HO-1) and others. Improving endogenous antioxidant defenses and phase II detoxification via Nrf2 pathway represents a new class of therapeutic strategies to protect the cells against inflammation and oxidative stress . The effectiveness of natural antioxidants in preventing diabetic complications is still uncertain. In human clinical trials, antioxidants as adjuvants showed no added benefit in the management of diabetic complications. The ‘new mechanism-based antioxidants’ NMBA are a novel class of Nrf2 activators with possibly greater efficacy to avert diabetes and its complications . Vitagenes are a group of genes strictly involved in preserving cellular homeostasis during stressful conditions. Vitagenes encode for cytoprotective heat shock proteins (Hsp) Hsp70, Heme Oxygenase-1 (HO-1), Thioredoxin reductase and Sirtuin proteins. Heme Oxygenase-1 (HO-1) has a major role in counteracting both Oxidative and Nitrosative Stress. In fact, Heme oxygenase-1 (HO-1) induction is one of the early events in the cell’s response to stress. Heme Oxygenase-1 exerts a protective role, by degrading the intracellular levels of pro-oxidant heme and by producing biliverdin, the precursor of bilirubin. Bilirubin is an endogenous molecule with potent antioxidant and anti-nitrosative features . Some of the Vitagenes are also upregulated as part of the phase 2 response, also known as the electrophile counterattack response, a cytoprotective response that protects against various electrophiles and oxidants. Examples include Heme Oxygenase 1, Thioredoxin, and Thioredoxin reductase, all of which can be upregulated by the transcription factor Nrf2 in coordination with a battery of cytoprotective proteins . Proteasome is the major multi-enzyme complex that removes damaged proteins within cells, both in the nucleus and the cytosol. The ubiquitin-proteasome system is responsible for the protein quality control in a given cell in general through degradation or removal of misfolded or damaged proteins that would adversely affect cell function. The continuous synthesis and degradation of proteins plays an essential role in the maintenance of cellular homeostasis and regulation of multiple cellular functions. People with diabetes have elevated levels of modified proteins arising from glycation and glycoxidation reactions. Glycated proteins arise from the non enzymatic reaction of glucose, and reactive aldehydes derived from glucose, with proteins, lipids and nucleic acids. An accumulation of modified proteins is implicated in a wide range of age-related diseases including Alzheimer’s disease, Parkinson’s disease, Cataractogenesis, Atherosclerosis and Diabetes. This accumulation implies either an increased rate of formation of damaged proteins or a decreased rate of removal, or both. Hyperglycemia impairs proteasome function through intracellular AGEs (advanced glycation end products) and RCS (reactive carbonyl compounds) Methylglyoxal (MGO) and Glyoxal. Intracellular hyperglycemia activates four major pathways implicated in the pathogenesis of diabetes complications: the hexosamine and polyol pathways, protein kinase C isoforms, and formation of AGEs and RCS . Autophagy is a predominantly cytoprotective (rather than a self-destructive) process. Beyond its function in the adaptation of individual cells or organs to changing conditions, autophagy has a prominent role in determining the life span. Reduced autophagy has been associated with accelerated aging, whereas stimulation of autophagy might have potent anti-aging effects . Autophagy is a process of cellular self-cannibalism in which portions of the cytoplasm are sequestered within double- or multi membraned vesicles (autophagosomes) and then delivered to lysosomes for bulk degradation. Autophagy is the mechanism through which the nonnuclear (cytoplasmic) parts of the cell can be renewed and through which cytoplasmic macromolecules can be mobilized to generate energy-rich compounds that can meet the bioenergetic demand of the cell in conditions of dwindling external or internal resources. Autophagy is also a critical regulator of organellar homeostasis, particularly of mitochondria. Dysfunctional mitochondria that have lost their membrane potential and are more likely to release toxic apoptotic mediators and reactive oxygen species are apparently selectively removed by autophagy . Autophagy is activated during nutrient deprivation to promote cell survival and to increase amino acid retrieval. Paradoxically, autophagy also represents a form of non apoptotic cell death and is called as ‘‘type 2 programmed cell death’’. Thus, autophagy may either promote cell death through excessive degradation of cellular constituents or protect cells from cell death by providing essential nutrients and removing damaged organelles during cellular stress, depending on the cellular and environmental context. Because autophagy degrades unnecessary or dysfunctional organelles such as mitochondria and rejuvenates their function, autophagy is expected to play important roles in the development and the maintenance of physiological function of normal tissues. In fact, disruption of autophagic process leads to failure of cavitation during embryogenesis or accumulation of abnormal mitochondria in adult tissues. Autophagy is necessary to maintain structure, mass and function of pancreatic beta cells, and its impairment cause insulin deficiency and hyperglycemia because of abnormal turnover and function of cellular organelles . Resveratrol [22,23,25] and Curcumin [22,23,25] are two well known modulators of Proteasome function, Apoptosis and Autophagy. The overall effect is cytoprotective and pro survival. Pterostilbene confers a profound cytoprotective effect through Nrf2 activation in pancreatic beta-cells. In addition, the antioxidant and anti-apoptotic properties of Pterostilbene also provide evidence for its cellular protective functions . “Pterostilbene increased the expression of target genes downstream of Nrf2, such as heme oxygenase 1 (HO1), superoxide dismutase (SOD), catalase (CAT) and glutathione peroxidase (GPx), that confer cellular protection. Pterostilbene also up-regulated the expression of anti-apoptotic gene, Bcl-2, with a concomitant reduction in pro-apoptotic Bax and caspase-3 expression” . “The Neuroprotective effect of Resveratrol against amyloid beta toxic effects could be also mediated by promoting the intracellular degradation of amyloid beta, through the ubiquitin proteasome system (UPS)” . In addition to diet and exercise, the above natural substances including Cresvin Beta are capable of Awakening or Activating the Endogenous Antioxidant, Defense and Repair systems. They also inhibit chronic inflammation, they ‘Awaken the Power Within’, to prevent and combat Diabetes, Hypertension and various chronic inflammatory diseases. Through adoption of healthy lifestyles that include outdoor sports, exercises, balanced diet, avoidance of stress and adequate night time sleep. The Prevention and Remission of Diabetes – PROD Initiative addresses the above factors in a holistic manner in collaboration with leading Physicians and Experts. -GI value below 50 is considered low. -GI value between 50 ‐60 is considered average. -GI value above 60 is high. -Here are the GI scores of some of the commonly available fruits: black Jamun (25), cherries (20), pear (38), apple (39), orange (40), plum (40), strawberry (41), peach (42), guava (32). Apart from providing a mouth watering luster to a delicious dessert, strawberries bear a name of super food for diabetics. They are enriched with potassium (which helps in keeping blood sugar level in check), antioxidants, and vitamins. Moreover, they have low GI level. So strawberries have a lot to offer from their indulging taste to added topping of value. Nutritional value: 100 gm strawberries has 33 Kcal calories and 8 grams of carbohydrates. This fruit holds a special significance owing to its numerous qualities. Every part of Jamun holds wondrous properties to fight diabetes. Its seeds can be powdered and consumed each day in the morning on an empty stomach. The fruit pulp and bark are rich in vitamins, antioxidants and have low GI value. Nutritional value: 100 grams contain 60 Kcal and 16 grams of carbohydrates. Apples are also loaded with fiber and a good source of vitamin C and have a low glycemic index which makes them a good option for diabetics. Don’t peel your apples, though, the skins are the most nutritious part, full of antioxidants. Nutritional value:100 grams contain 52 Kcal and 14 grams of carbohydrates. Guava gives you yet another reason for not depriving yourself of healthy fruits. It is mostly advised to eat without its skin which reduces sugar absorption in the blood. Guavas are high in vitamin A, vitamin C, and dietary fiber. This fruit has a reasonably low GI making it a part of a diabetics’ must have fruits plate. Nutritional value: 100 grams of guava has 51 Kcal and 12 grams of carbohydrates. Peaches contain vitamins A and C, potassium, and fiber and are delicious on their own or tossed into iced tea for a fruity twist. You can also add them to your salads or desserts as a delicious topping. Orange is a powerhouse of vitamin C. It has a low GI and is rich in folate and potassium, which may help normalize blood pressure. You can have it as a mid-day snack or carry it in your bag for that glucose punch that you may need when you are at work or traveling. Diabetes results from a deficiency or functional impairment of insulin producing Beta cells, alone or in combination with insulin resistance (IR). The replacement or regeneration of Beta cells in humans and rodents has great promise in reversing diabetes as proven by stem cell therapies that create new human Beta cells. Here we present compelling reasons for adopting a healthy lifestyle, a balanced diet, regular physical exercise and the need for preventing and relieving stress. Beta Cells need to be saved very early in life; much earlier than we thought! Beta Cell proliferation begins shortly after birth and continues till the age of 2 years, after which further proliferation practically stops. The rate of Beta cell proliferation is highest (1-3%) in the 1st year of life. The rate of Beta cell proliferation declines to less than 0.2% on reaching 2 years of age and the normal adult rate of Beta cell proliferation is 0.1% . Throughout adult life the Beta cell mass is relatively constant in healthy individuals. Dietary intake of sugary foods and drinks combined with a sedentary lifestyle causes the fasting plasma glucose to rise steadily during adolescence and adult life. Chronic inflammation can lead to loss of beta-cell mass through apoptosis and perhaps necrosis. It is the balance between neogenesis and replication and cell death that really determines our beta-cell mass. There is an increase in beta cell mass and an adaptation to the increase in demand for insulin in obese individuals. A decline in Beta Cell function happens due to exhaustion, mitochondrial dysfunction and de-differentiation of Beta Cells due to various causes. This emphasizes the need for very early intervention via non pharmacological means to delay the onset of Metabolic Syndrome. The window of opportunity for prevention of diabetes exists because; β cell death begins 10-12 years before diagnosis of diabetes. Numerous studies including the UKPDS have shown that diabetics have already lost 50% of their β cells (at the time of diagnosis) . In diabetes, there is a 3 to 10 fold increase in Beta cell apoptosis. Thus, there is a dire need to save the Beta Cells very early in life through adoption of healthy lifestyles that include outdoor sports, exercises, balanced diet, avoidance of stress and adequate night time sleep. The Prevention and Remission of Diabetes – PROD Initiative addresses the above factors in a holistic manner in collaboration with leading Physicians and Experts. Disclaimer: Cresvin Beta Team has taken maximum care to ensure that the information is authentic. The information has been extracted from published medical trials and text books. The information is not meant to substitute a Physicians advice, nor is it meant to treat any disease. Members are advised to consult a Physician, Dietician, Physiotherapist or Trainer before taking medication or commencing an exercise program. Insulin resistance, inadequate insulin secretion, hormonal imbalances, stress and mitochondrial dysfunction play an important role in the pathogenesis of all form of Diabetes. Insulin Resistance results from inherited and acquired influences. Hereditary causes of Insulin Resistance include mutations of insulin receptor, glucose transporter, and signaling proteins, although the common forms are largely unidentified. Acquired causes of Insulin Resistance include physical inactivity, diet, medications, hyperglycemia (glucose toxicity), increased free fatty acids, and the aging process. A sedentary lifestyle or lack of exercise reduces the function of insulin receptors present on the surface of each cell. This results in reduced muscular and tissue uptake of glucose and causes hyperglycemia. Insulin resistance results in increased insulin secretion to maintain normal glucose and lipid homeostasis. This compensatory hyperinsulinemia leads to endothelial dysfunction, atherosclerosis, metabolic syndrome, type 2 diabetes and cardiovascular diseases; in addition to Beta cell failure. Mitochondrial dysfunction may play an important role in the development of insulin resistance and associated complications. Obesity, the most common cause of insulin resistance, is associated with a decreased number of receptors and with post-receptor failure to activate tyrosine kinase. Insulin binds and acts mainly through the insulin receptor and also acts via the insulin like growth factor–1 (IGF-1) receptor; cellular actions of insulin involve a wide variety of effects on post-receptor signaling pathways within target cells. Aging may cause insulin resistance through a decreased production of GLUT-4. Increased production of insulin antagonists. Glucocorticoid therapy is a common cause of glucose intolerance; impairment of glucose tolerance may occur even at low doses when administered for long term periods. Increased levels of the acute-phase inflammatory marker C-reactive protein (CRP) are related to insulin resistance and the metabolic syndrome, suggesting a role for chronic low-grade inflammation. Dietary and endogenous Advanced Glycation End Products (AGEs) trigger a cascade of inflammatory mediators and cytokines like TNF alpha, NF kappa B, Interleukin-6 and Interleukin 1Beta; resulting in long term chronic low grade inflammation. How to reduce Insulin Resistance? Exercise is the best way to reduce Insulin Resistance or improve Insulin Sensitivity. Regular exercise involving all major muscle groups in the body increases the number and function of Insulin Receptors. This helps muscular glucose uptake or insulin-mediated glucose uptake. Walking, running, swimming and outdoor sports activities can significantly reduce Insulin Resistance. 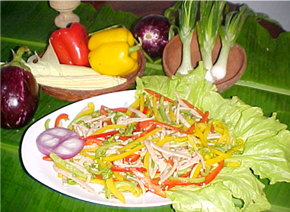 A healthy diet should include nuts, fresh fruits, sprouts and vegetables (preferably raw). Avoidance of fried foods, roasted foods as well as foods cooked at high temperatures may be important to reduce the levels of AGEs (Advanced Glycation End products), ALEs (Advanced Lipoxidation End products) and AOPP (Advanced Oxidation Protein Products). AGEs, ALEs and AOPPs trigger chronic low grade inflammation, which is a major component of Diabetes and many other chronic diseases. Some of the natural products mentioned earlier, for saving Beta Cells act by improving insulin receptor sensitivity, intracellular glucose transport (GLUT 4) and insulin signaling; thereby reducing Insulin Resistance. The natural products include Resveratrol, Pterocarpus and Curcumin which also play a major role in inhibiting ‘chronic low grade inflammation’. Two meta-analyses of total 20 randomized controlled trials also confirm that Resveratrol significantly reduces insulin resistance and fasting plasma glucose [36, 37]. Salacia improves insulin resistance, glucose metabolism and reduces obesity . Pterocarpus improves Insulin receptor sensitivity and induces PPAR alpha . Gymnema augments glucose uptake and ameliorates insulin resistance by upregulating GLUT-4 (glucose transporter-4), peroxisome proliferator-activated receptor-gamma (PPAR gamma), adiponectin, and leptin levels . Curcumin increases glucose uptake into skeletal muscle by improving the expressions of GLUT4 and reduces insulin resistance in muscular tissue through other mechanisms . As mentioned earlier, the above natural ingredients (in Cresvin Beta) have significant anti inflammatory actions. In combination they have a synergistic action in reducing insulin resistance and thereby saving the Beta Cells. This could go a long way in reducing the morbidity of Diabetes and various life style diseases. The Prevention and Remission of Diabetes – PROD Initiative is a holistic approach, laying greater emphasis on improvement of beta cell mass and function; through diet, exercises and reduction of mental stress, in addition to medication as advised by the Physician. Disclaimer: Cresvin Beta Team has taken maximum care to ensure that information is authentic. The information has been extracted from published medical trials and text books. The information is not meant to substitute a Physicians advice, nor is it meant to treat any disease. Members are advised to consult a Physician, Dietician, Physiotherapist or Trainer before taking medication or commencing an exercise program. Several mediators are thought to signal the pancreatic Beta cells to respond to insulin resistance. These potential signaling mediators include glucose, free fatty acids, autonomic nerves, fat-derived hormones (Adiponectin), and the gut hormone glucagon like peptide-1 (GLP-1). GLP-1 is an incretin hormone that stimulates insulin secretion, causes Beta cell mitosis while inhibiting apoptosis, inhibits glucagon secretion, and delays gastric emptying with overall anti-diabetic effects. Leptin and Ghrelin are 2 hormones that have a major influence on energy balance. Leptin is a long-term regulator of energy balance, suppressing food intake and thereby inducing weight loss. Ghrelin is a fast-acting hormone, seemingly playing a role in meal initiation. Thyroid hormone plays a very important role in energy expenditure. They are all interconnected via complex signaling pathways. It is becoming more and more evident that proper diet, exercise, clean environment and stress reduction are the fundamental requirements for a healthy life. Advancements in medical science are slowly unraveling the complex interactions; however we are closer to a clear understanding of the complex interactions or finding a cure. The ingredients of Cresvin Beta are meant to assist Diabetics in their fight against diabetes; under the supervision of a Diabetologist. The scientific team at Apex Laboratories Private Limited has designed Cresvin Beta for improving the functioning of the metabolic pathways and favourably altering the hormone levels; in an attempt to prevent Diabetes and also aim for remission whenever it is possible. The chances of remission are greatly increased if the various interventions are done at an early stage there are sufficient reserves of functional Beta Cells. Some of enzymes in the metabolic pathway also play a very important role in the pathogenesis of Diabetes. The ingredients in Cresvin Beta are known to regulate these enzymes, in addition to the hormones. One of the major anti diabetic herbal in Cresvin Beta is Pterocarpus marsupium. It has been proven as an effective anti diabetic in Indian trials [28, 33]. It has a holistic range of actions, but here we focus on the enzymes and the hormones which are dysregulated in Diabetes. Shows potent insulinotrophic and insulin-like properties . Shares a common signaling pathway with Insulin . Increases glycogen synthesis by restoring the level of glycogen synthase . Improves GLP-1 to reduce PPHG-Post Prandial Hyper Glycemia in 86% (out of 172) patients . Resveratrol improves GLP-1 to reduce PPHG-Post Prandial Hyper Glycemia Resveratrol treatment for 5 weeks is associated with increased circulating levels of GLP-1 and insulin and enhanced levels of intestinal proglucagon mRNA transcripts. Consistent with these findings, Resveratrol combined with a Dipeptidyl peptidase (DPP-4) inhibitor(Sitagliptin) augments portal GLP-1 concentrations and further improves glucose homeostasis . Resveratrol supplementation suppresses postprandial Glucagon responses, which may represent a novel protective mechanism against the development of disturbed glucose tolerance and Type 2 diabetes . Salacia extracts modulate multiple targets that influence carbohydrate and lipid metabolism including α-glucosidase, aldose reductase, pancreatic lipase, PPAR alpha and GLUT-4 mediated glucose uptake. In human studies, Salacia extracts have been shown to decrease plasma glucose and insulin levels, decrease HbA1c, and modulate serum lipid levels with no adverse effects being reported . Gymnema augments glucose uptake and ameliorates insulin resistance by upregulating GLUT-4, PPAR gamma, adiponectin, and leptin levels . Resveratrol has ability to restore Thyroid Hormone (T3) levels .Resveratrol also influences thyroid function by enhancing iodide trapping and, by increasing TSH secretion via activation of sirtuins . In general, consumption of dietary polyphenols has beneficial effects including reducing blood glucose levels and improving insulin sensitivity in metabolic syndrome, type-2 diabetes, and obesity. Some polyphenols clearly appear to have the potential to modulate neuropeptides involved in food intake and satiety . As mentioned above, the natural ingredients (in Cresvin Beta) have significant actions in regulating metabolic pathways and hormones. In combination they have a synergistic action. This could go a long way in reducing the morbidity of Diabetes and various life style diseases. Mitochondria are energy producing organelles inside each human cell. They are bacteria like structures which have their own genetic material or DNA, RNA and protein synthesizing systems. Just like bacteria they can divide on their own (fission) and also fuse with each other (fusion). Mitochondria have a symbiotic relationship with the main cell and there is an elaborate signaling system between them and the nucleus of the cell. Mitochondria are often affectionately nicknamed “the powerhouse of the cell.” The epithet is well earned, as one of the most important contributions of the mitochondria to the cell is the production of ATP through oxidative phosphorylation (OXPHOS). Adenosine tri phosphate (ATP) is the ‘energy currency’ of the body and it provides the energy for all the enzyme reactions and other processes in the cells. ATP is found in all living cells whether it is humans, animals, insects or bacteria. When consumed in metabolic processes, phosphorus ion donated and it converts to either the di- or monophosphates, respectively ADP and AMP. Mitochondria regenerate ATP through OXPHOS by adding phosphorus again. The human body recycles its own body weight equivalent in ATP each day. The optimal functioning of the Mitochondria and Mitochondrial Biogenesis is thus very critical for growth and health. Each human cell contains hundreds of mitochondria. They burn the calories in our diet with the oxygen that we breathe to make chemical energy to do work and heat to maintain our body temperature. The mitochondria generate energy by oxidizing hydrogen derived from our dietary carbohydrates (TCA cycle) and fats (Beta-oxidation) with oxygen to generate heat and ATP. As a by-product of energy production, the mitochondria also generate most of the endogenous reactive oxygen species (ROS) of the cell, and these damage the mitochondria, mtDNAs, and the cell. The number of mitochondria in any tissue depends upon the energy needs of the tissue. Organs with high energy expenditure like the brain, heart and skeletal muscles have a higher number of mitochondria. Any reduction in the number or functions of the mitochondria in the tissues results in reduced functions of the organs and leads to chronic diseases. It has been observed that aged mitochondria have diminished ATP production. Life is the interplay between structure and energy, yet the role of energy deficiency in human disease has been poorly explored by modern medicine. Declining mitochondrial function is now being recognized as one the causes for the delayed onset and progressive course of age related degenerative diseases . Communication between the nucleus and mitochondria is essential for maintenance of appropriate mitochondrial activity, and disruption of this coordination often accompanies aging and age-related disease . Calorie restriction (CR) can stimulate mitochondrial biogenesis and increase the expression of mitochondrial enzymes involved in OXPHOS. CR reduces the incidence of age-related diseases such as diabetes, cancer and cardiovascular disease . Calorie restriction activates Sirtuin1, PGC1 (peroxisome-proliferator-activated receptor gamma coactivator-1) family of transcriptional coactivators, AMPK (AMP-activated protein kinase), Nrf2 and other factors that improve mitochondrial function and also stimulate mitochondrial biogenesis . Resveratrol mimics CR and stimulates mitochondrial biogenesis . Resveratrol salvages mitochondria from injury caused by hypoxic ischemia . “The development of effective pharmacological therapies for OXPHOS deficiencies has been extremely limited so far. Nutritional supplementation has been tried: coenzyme Q10, vitamin C, creatine, sodium dichloroacetate, sodium pyruvate, and L-arginine. This generated some evidence of improved symptoms or slower progression in subsets of patients, but a pressing need for frontline treatments remains. A possible therapeutic approach for OXPHOS deficiencies is to increase the number of mitochondria per cell, which can result in greater capacities to produce ATP. Another strategy is to reduce the cell-damaging side effects of dysfunctional OXPHOS, i.e., the generation of harmful reactive oxygen species (ROS) and cell death. 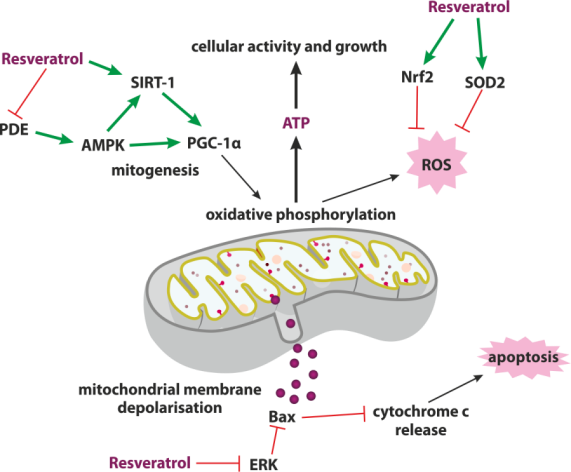 The above figure is a summary of proposed beneficial effects of resveratrol on mitochondrial respiration and cell survival . Mitochondrial biogenesis is a highly synchronized process driven by changing energetic demands. Regulation is governed by a complex system of transcription factors and co-activators, in which PGC-1 functions as a master regulator. Stimulation of PGC-1 activity results in increased mitochondrial mass and function. PGC-1 expression in its turn is controlled by the peroxisome proliferation activated receptor family (PPAR) and by SIRT-1 . In addition to sufficient amounts of mitochondria to achieve desirable ATP levels in the cell, interconnection of mitochondria into a complex cell-spanning network is another requisite for proper OXPHOS functioning. The mitochondrial network takes shape through the dynamic equilibrium between fusion and fission of the organelles, complexly regulated by changing cellular conditions . In primary human coronary arterial endothelial cells, 10 micro moles Resveratrol for 48 h significantly increased mitochondrial mass and mtDNA content. In vivo, a significantly increased mitochondrial biogenesis was detected in Resveratrol fed mice. In addition, Resveratrol treatment of cultured skin fibroblasts obtained from healthy individuals was shown to stimulate the expression of mitochondrial transcription factor (TFAM). TFAM is a key factor for mtDNA replication and repair and thus crucial for mitochondrial proliferation . In response to oxidative damage, the mitochondrial stress response protein sirtuin-3 (SIRT-3) induces forkhead box O3 (FoxO3a) translocation toward the nucleus, activating antioxidant defense mechanisms. SIRT-3 can directly activate SOD2 via protein/lysine deacetylation. Antioxidant defenses tend to decrease with age. Resveratrol has been reported to trigger cellular anti-oxidant defense mechanisms in aging endothelial cells. 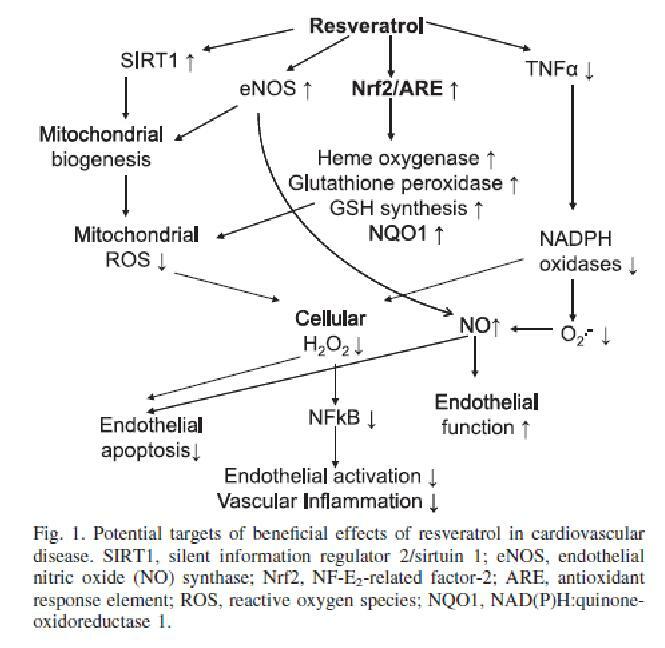 In cultured primary human coronary arterial endothelial cells, Resveratrol increases the transcriptional activity of Nrf2. Nrf2 regulates the expression of numerous ROS detoxifying genes. These defense mechanisms also salvage mitochondria from injury caused by hypoxic ischemia. Further evidence has been gathered that Resveratrol is capable of restoring ROS homeostasis within cells . Impairment of mitochondrial biogenesis is frequently observed in diabetes and the metabolic syndrome and contributes to cellular energetic imbalance, oxidative stress, and endothelial dysfunction. Dysregulation of mitochondrial biogenesis represents an early manifestation of endothelial dysfunction, shifting cell metabolism toward metabolic hypoxia in animals with impaired nitric oxide (NO) bioavailability . Resveratrol improves mitochondrial function and biogenesis in the skeletal muscle and the liver. Resveratrol treatment improves endothelial function and attenuates vascular inflammation in diabetes mellitus and extends longevity . Many studies suggest that mitochondrial dysfunction is associated with age-related diseases such as diabetes. Additionally, a study by Petersen et al. (2003) showed that elderly subjects had a marked increase in insulin resistance in muscle accompanied by decreases in mitochondrial substrate oxidation and ATP synthesis. Expression of genes involved in OXPHOS is reduced in diabetic patients, their first-degree family members and individuals with glucose intolerance. Studies showed that PGC-1alpha expression levels were also decreased . Cardiovascular disease is another hallmark of aging, and PGC-1alpha has been linked to the pathogenesis of heart failure. PGC-1alpha is decreased in some forms of heart failure that are associated with a decrease in fatty acid oxidation and an increased reliance on glucose oxidation. End stage heart failure is often associated with reduced mitochondrial respiration and ATP production. There is much evidence to suggest that falling PGC-1alpha levels may play a role in age-related heart failure. Several studies suggest a link between PGC-1alpa & neurodegeneration. Impaired mitochondrial function, including decreased expression of genes involved in OXPHOS, is linked to a number of neurodegenerative diseases such as Parkinson’s, Alzheimer’s and Huntington’s disease . Resveratrol does reduce the severity of physical hallmarks of aging, including cataract formation, loss of motor coordination, decline in bone mineral density and increased aortic inelasticity. SIRT1 can regulate insulin secretion from pancreatic beta cells, at least in part by regulating expression of uncoupling protein 2 (UCP2) . Communication between the mitochondria and nucleus is crucial for maintenance of appropriate mitochondrial function. As a result, mitochondrial-nuclear signaling plays an integral role in normal energy homeostasis and disruption contributes to aging and age-related disease . Improvement in mitochondrial function and biogenesis will thus be an important aspect of disease prevention or regression. 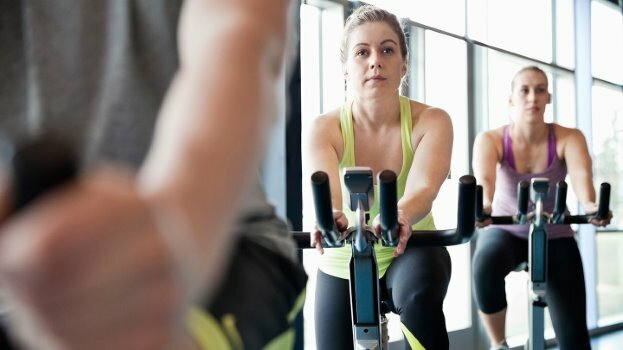 We wish to re-emphasize that a regular exercise program coupled with a balanced diet, adequate night-time sleep and stress relieving techniques are very important for the ‘prevention and remission of diabetes’ PROD. The Prevention and Remission of Diabetes – PROD Initiative is a holistic approach, laying greater emphasis on improvement of beta cell mass and function. Improvement of mitochondrial function and biogenesis within the beta cells and other cells in the pancreas will go a long way in restoring metabolic homeostasis. In Type 2 diabetes mellitus (T2DM) there is a more than 2-fold greater risk of developing heart failure (HF) and a 60%–80% greater probability of death in those with established HF. Evidence suggests that T2DM itself can drive adverse cardiac remodeling and give rise to diabetic cardiomyopathy and is reportedly evident in up to 60% of patients with T2DM. Diabetic cardiomyopathy is characterized by unexplained myocardial hypertrophy and fibrosis, with left ventricular (LV) diastolic impairment. At the cardiomyocyte level various defects including calcium mishandling and increased oxidative stress are present. Mitochondrial dysfunction is associated with abnormal myocardial structure and function in T2DM. Reductions in OXPHOS manifest in decreases in myocardial PhosphoCreatine and ATP content which have been shown in animals and humans with T2DM. . Profound alterations in myocardial substrate metabolism and energetics have been shown. Crucially, these metabolic derangements precede cardiac structural and functional changes. Their early correction in animal models of T2DM aborted the development of diabetic cardiomyopathy. Consequently, metabolic abnormalities of the heart are promising therapeutic targets whose amelioration might improve outcomes in T2DM . The heart is the highest energy consuming organ of the body, needing about 30kg of ATP per day. This is nearly 75-100 times the weight of the heart . The mitochondria in the muscles of the heart produce the required ATP by the process of oxidative phosphorylation or OXPHOS. For continuous ATP generation there should be sufficient functional mitochondria and a continuous supply of oxygen and fuel substrates. Consistent with its high energy demands, the myocardium has the highest mitochondrial density (35% of cardiomyocyte volume versus 3%–8% in skeletal and smooth muscle cells) of any organ, and its mitochondria exhibit the greatest number of cristae which enhance OXPHOS . Fatty Acids (FA) are the preferred fuel substrates and account for 70%–90% of myocardial ATP generation.Glucose oxidation accounts for 10%–30% of cardiac ATP production. In T2DM there is an increase in plasma FA levels as a result of increased lipolysis from insufficient insulin action, increased hepatic triglyceride production and inefficient adipocyte triglyceride storage. This leads to greater myocardial uptake and utilization of FA. Myocardial FA abundance activates PPAR-α which amplifies the reliance on FAs further by upregulating FA uptake, storage and β-oxidation, while suppressing glucose utilization . Excessive FA uptake by myocardium and accumulation of triglycerides lead to generation of more ROS, disrupt signalling and trigger cardiomyocyte apoptosis. Even though FAs generate more ATP than glucose for each molecule metabolized, it comes at much higher oxygen cost. FA oxidation results in approximately 86% greater myocardial oxygen consumption compared to glucose . Despite systemic hyperglycaemia, cardiac glucose oxidation is reduced by 30%–40% in patients with T2DM. Cardiac mitochondria exhibit diminished rates of OXPHOS and a greater uncoupling of respiration from ATP generation in T2DM . Aging is associated with muscle insulin resistance, increased intra-myocellular fat content, and reductions in rates of muscle mitochondrial activity. Aging is also associated with a marked inability of mitochondria to switch from lipid to glucose oxidation on insulin stimulation, which may further contribute to dysregulated glucose and lipid metabolism in the elderly . Mitochondria in resting skeletal muscle of both young lean insulin sensitive healthy control subjects and insulin resistant elderly subjects rely similarly ( about 85%) on fatty acid oxidation to meet their energy requirements despite the presence of muscle insulin resistance in the elderly . Death from HF within 5 years of diagnosis is common despite current opti­mal medical therapy. Mortality and re-hospitalization within 60–90 days after discharge from hospital can be as high as 15% and 35%, respectively. These event rates have largely not changed over the past 15 years, despite implementation of evidence-based therapy. Commonly prescribed HF medications, although beneficial in promoting some symptom relief, often do not fully address the underlying causes of progressive left ventricular dysfunction . Most standard care pharmacological approaches to HF, act by reducing workload on the failing heart. They attempt to rebalance energy supply and energy demand to a lower level. Although these therapies have improved survival in patients with chronic ambulatory HF over the past 2–3 decades, death and poor qual­ity of life continue to adversely affect this ever-increasing patient population . This unmet need is probably not going to be met by drugs that modulate neurohormonal abnormalities and lower heart rates, because further inter­vention along these axes is likely to be counterproductive as hypotension and bradycardia become limiting factors . The search for more effective and complementary therapy for this patient population must be focused on improv­ing the intrinsic function of the viable, but dysfunctional, cardiac unit — the cardiomyocytes. The novel therapy must be hemodynamically neutral (no decrease in blood pressure or heart rate) and must target the myocardium as the centrepiece of the therapeutic intervention. Stimulating mitochondrial glucose oxidation, either directly or by inhibiting fatty acid catabolism, has been suggested as a viable therapeutic strategy to compensate for the energetically ‘starved’ failing heart . Treatment with Resveratrol decreases the serum level of FFA. Resveratrol treatment increases peripheral glucose utilization as an energy substrate and decreases FFA oxidation, as demonstrated by a greater respiratory quotient (RQ). Resveratrol protects the metabolic shifting in cardiac tissue and hence cellular energy homeostasis and maintenance of the glycolytic pathway. The supplementation of Resveratrol becomes important in controlling cardiac contractility and improves heart function under diabetic conditions . Glycemic control alone may not be sufficient to prevent or manage Diabetic Cardiomyopathy . Resveratrol may act directly by scavenging the ROS or increase the endogenous antioxidant defenses. Resveratrol decreased the concentration of biomarkers of oxidative stress produced in diabetes mellitus. Resveratrol recovered glucose homeostasis, normalized free fatty acid oxidation, enhanced utilization glucose, regulated myocardial metabolic enzymes and calorimetric parameters, and optimized cardiac energy metabolism in diabetes conditions . Resveratrol completely prevented cardiac FA utilization reduction and improved mitochondria-driven energy supply while preserving expression of mitochondrial fusion protein. This suggests that amelioration of energy metabolism may contribute to the regression of HF independent of cardiac hypertrophy . The components of Cresvin Beta reduce excessive Fatty Acid Oxidation in Diabetes. It improves Cardiac Substrate Utilization and therefore increases Cardiac Energy Output. Thus Cresvin Beta and the PROD Initiative will be a valuable means of preventing the progression of Diabetic Cardiomyopathy and other complications of diabetes. Diabetes mellitus is a metabolic disorder in the endocrine system. This dreadful disease is found in all parts of the world and becoming a serious threat of mankind health. There are lots of chemical agents available to control and to treat diabetic patients, but total recovery from diabetes has not been reported up to this date. In addition to adverse effects, drug treatments are not always satisfactory in maintaining euglycemia and avoiding late stage diabetic complications. Alternative to these synthetic agents, plants provided a potential source of hypoglycemic drugs and are widely used in several traditional systems of medicine to prevent diabetes. Several medicinal plants have been investigated for their beneficial effect in different type of diabetes. Other alternative therapies such as dietary supplements, acupuncture, hydrotherapy, and yoga therapies less likely to have the side effects of conventional approaches for diabetes. Diabetes mellitus is a metabolic disorder characterized by hyperglycemia, abnormal lipid, and protein metabolism along with specific long-term complication affecting the retina, kidney, and nervous system. Diabetes mellitus has a significant impact on the health, quality of life and life expectancy of patients as well as on the health care system. Diabetes mellitus has been recognized as a growing worldwide epidemic by many health’s advocacy group including WHO. The WHO has estimated that diabetes will be one of the world leading cause of death and disability with next quarter century. The statistics are alarming; 30 million people were diagnosed with diabetes worldwide in 1985, by 1995 the number had risen to 135 million, and at the current rate there will be some 300 million by the year 2025 as predicted by the WHO.Currently, there are more than 17 million type 2 diabetic patients in the United States (or ~5.9% of the population), 11 million in Europe, and 6 million in Japan; which represents a potential primary therapeutic market of over $6 billion. In the United States in 1997, the American Diabetes Association (ADA) reports that the total economic cost of diabetes was estimated to be $98 billion which includes $44 billion in direct medical and treatment costs, and $54 billion in indirect costs related to disability and mortality. The prevalence of all forms of diabetes is estimated to be 2%-3% of the world’s population, with the number of diabetics increasing by 4%-5% per annum. Diabetes is known to have a strong genetic component with contributing environmental determinants. Although the disease is heterogynous, there appear to be a fairly consistent phenotype once the disease is fully manifested. Whatever the pathogenic cause the early stage of diabetes is characterized by resistance insulin, targeting tissue mainly in liver, skeletal muscle, and adipocytes. Insulin resistance in the tissue is associated with excessive glucose production by the liver and impaired glucose utilization by peripheral tissue, especially muscle. Most of the food we eat is broken down into simply sugar called glucose. The glucose is the main source of fuel to get energy for the body. After digestion, the glucose reaches our blood stream, where it is available for body cells to utilize for energy, but insulin is needed for glucose to get into cells. Insulin is a hormone secreted by the pancreas to transport glucose from blood into different cells of the body. If the pancreas does not produce enough insulin or the produced insulin does not work properly, the glucose cannot enter the body cells. So glucose stay in blood cells which makes the blood sugar level high. Thus the body losses the main source of fuel for the energy even though the blood contain high amount of glucose. Since glucose is not metabolized, high amount of glucose circulate in blood, kidney remove extra sugar from blood and excrete it in the urine.Since body does not utilize glucose, the body is under constant impression of hunger that’s why in diabetes appetite increases and patient eat more frequently. With increased insulin secretion to compensate for insulin resistance, base line blood glucose level can be maintained with in the normal range, but the patient may demonstrate impaired response to prandial carbohydrate loading and to oral glucose tolerance test. The chronic over stimulation of insulin secretion gradually diminishes and eventually exhausts the islets beta cells reserve. The quality of life of diabetic patient with chronic and severe hyperglycemia is adversely affected. Characteristic symptoms of tiredness and lethargy can become severe and lead to a decrease in work performance in adults and an increase of falls in the elderly. The most common acute complications are metabolic problems (hyperosmolar hyperglycemic non ketonic syndrome or HHNS) and infections. The long-term complications are macrovascular complication, microvascular complications, and diabetic foot. The general consensus on treatment of type 2 diabetes is that life style management at the forefront of therapy options. In addition to exercise, weight control and medical nutrition therapy, oral glucose lowering drugs, and injections of insulin are the conventional therapies. Pharmacological treatment is indicated when fasting glucose level exceeds 140 mg/dl the postprandial glucose level exceeds 160 mg/dl or HbAlc exceeds 8 %. Oral glucose lowering drugs: Five classes of oral agents are approved for the treatment of diabetes. Oral therapy is indicated in any patients in whom diet and exercise fail to achieve acceptable glycemic control. Although initial response may be good, oral hypoglycemic drugs may lose their effectiveness in a significant percentage of patients. The drug category includes sulfonylurea, biguanide, alpha-glucosidase inhibitor, thiazolidinedione, and meglitinide. These drugs have various side effects such as sulfonylurea causes weight gain due to hyperinsulenemia[13,14] biguanide cause weakness, fatigue, lactic acidosis, alpha glucosidase inhibitor may cause diarrhea while thiazolidinediones may increase LDL-cholesterol level. Insulin is usually added to an oral agent when glycemic control is suboptimal at maximal dose of oral medication. Weight gain and hypoglycemia are common side effect of insulin.Vigorous insulin treatment may also carry an increase in atherogenesis. Regardless of the type of diabetes, patients are required to control their blood glucose with medication and/or by adhering to an exercise program and a dietary plan. Due to modernization of lifestyle type 2 diabetes mellitus is becoming a major health problem in developing countries. Patient with type 2 diabetes mellitus are usually placed on a restricted diet and are instructed to exercise the purpose of which primarily is weight control. If diet and exercise fail to control blood glucose at a desired level, pharmacological treatment is prescribed. These treatments have their own drawbacks ranging from development of resistance and adverse effects to lack of responsiveness in a large segment of patient population. Moreover, none of the glucose lowering agents adequately control the hyperlipidemia that frequently met with the disease. The limitation of currently available oral antidiabetic agents either in terms of efficacy/safety coupled with the emergence of the disease into global epidemic have encouraged alternative therapy that can manage diabetes more efficiently and safely. Complementary and alternative therapy is treatments that are neither widely taught in medical schools nor widely practiced in hospitals. The use of CAM in the worldwide is increasing. In 1997, 42% Americans had used an alternative medical therapy. Total visit to complementary practitioners (629 million) exceed total visit to US primary care physicians (386 million). In Canada, a recent survey found that 75% people with diabetes used nonprescribed supplements (herbal, vitamin, mineral, or others) and alternative medications. Overall research indicates that most people who use CAM therapies do so in addition to, rather than in place of conventional medical treatment although some do not receive any concurrent conventional medical care. CAM for diabetes have become increasingly popular the last several years. 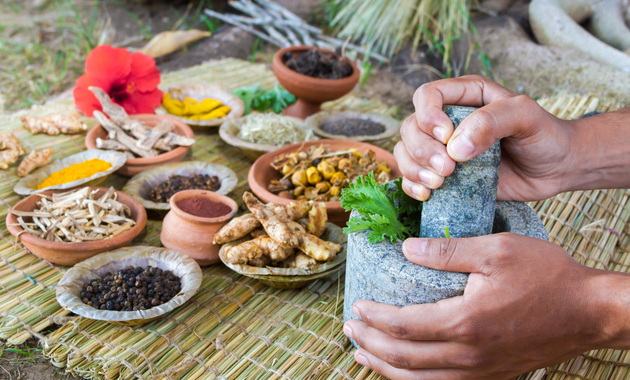 Alternative therapies with antidiabetic activity have been researched relatively, extensively, particularly in India. Ideal therapies should have a similar degree of efficacy without troublesome. Awanish Pandey et al; J Pharm Bioallied Sci. 2011 Oct-Dec; 3(4): 504–512. © 2019 Cresvin Beta. All Right Reserved.